Assassin’s Creed IV: Black Flag focuses on the story line of Edward Kenway who is grandfather to Connor, the main character of Assassin’s Creed III. As with past games in the Assassin’s Creed series, Black Flag is split into two separate portions. In one you take control of Edward Kenway has he sets sail across the Caribbean in the early 18th century. In the other you control an unknown person who works at Abstergo Entertainment and is tasked with investigating Edward Kenway’s life events. This portion takes place in current time from within the Animus, the device used to witness these past events. In Edward Kenway’s story you play as a man who is hell-bent on becoming something greater than he once was. Kenway was not fond of living in poverty with little to his name but a shack and a wife whom he loves. He sets out to become a privateer and later a full-blown pirate in a quest to earn a real living, hoping to return to his wife one day with money and glory to make her proud. Through a series of circumstantial events Kenway finds himself in the middle of a long-standing feud between two organizations: The Assassin’s and the Templars. He is faced with many choices and decisions that shape his destiny while being forced to accept the consequences of his actions, however severe they may be. The real world portion of the game, which takes place only in the Abstergo Entertainment building, is very convoluted and a bit hard to follow. Black Flag is the first game in the series to not feature Desmond Miles, ancestor to all previous assassin’s in all previous games, this includes Edward Kenway. It is hard to get the hang of what is happening until the end of the game when a lot of the confusion is cleared up, though it is never made clear who you are controlling. Outside of the Animus is a great place to access information about previous games, characters, and all things related to the Assassin’s and the Templars both past and present. I found Black Flag’s story line to be one the best yet in the Assassin’s Creed series. The game is a roller coaster of emotions and true testament to the series as a whole. Edward Kenway is not your average Assassin’s Creed main character which makes this experience different yet refreshing. He must figure out the story of the Assassin’s and the Templars on his own and because of that the narrative takes on many twists and turns, making for an enjoyable experience. 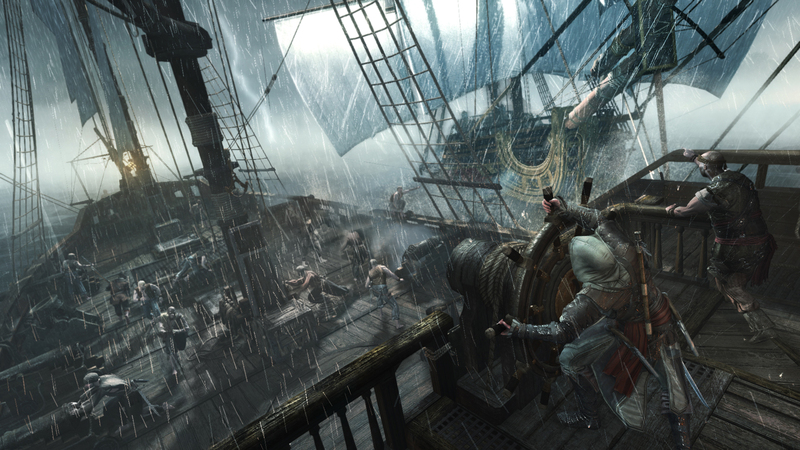 Assassin’s Creed IV features various styles of gameplay. As with past games in the series stealth is key in regards to the missions, though it is still an option in most cases. Many missions will attempt to steer you into a stealth style of gameplay but if you are not in the mood to be sneaky there is always the “guns blazing” approach, which is typically more difficult. There are a few missions though that will require you to be unseen and/or not kill anyone and there are plenty of missions in which up close and personal combat is encouraged. 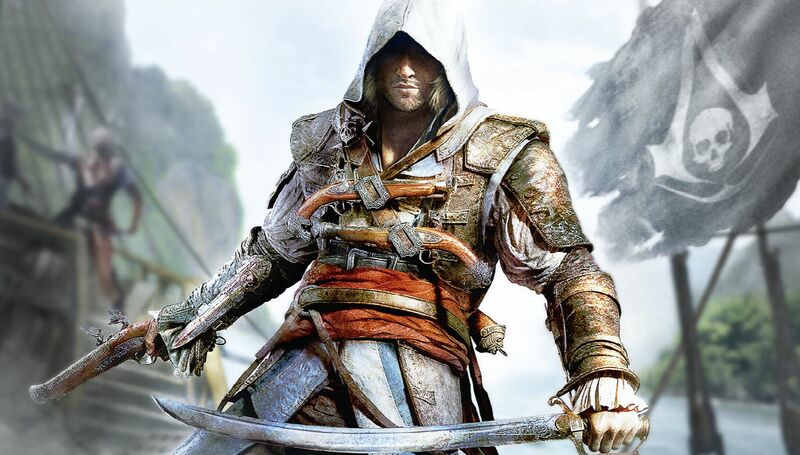 Edward Kenway is equipped with pair of swords, hidden blades, and a pistol. Kenway can hold up to four pistols total and will also acquire a few extra weapons, such as the blowpipe, throughout the game. As is the usual with games in this series there is plenty of platforming to be had. There is also tons of exploration of the environment in order to acquire collectibles and treasures, as well as to simply get from point A to point B. The game allows players to travel around an open-world map via a pirate ship called The Jackdaw or through the fast travel system once you have been to a location at least once. There is a plethora of islands and other areas that you may explore at will. Some are more important and must be traveled to for story progression such as Kingston and Tulum, others are optional and traveling to/exploring them is up to you. Each location features extras and/or treasure chests and most will have collectibles such as sea shanties or optional objectives such as Assassin contracts. This creates a really expansive environment that allows for many extra hours of gameplay, regardless of whether or not you chose to adventure about. Black Flag also features naval battles that expand beyond what was available in previous games in the series. As you travel around the West Indies you will run across plenty of non-pirate ships and forts that you may attack and loot cargo from. This cargo is used to either repair your ship or to sell for extra money. Items such as wood and metal wont sell for much but are crucial to upgrading The Jackdaw. Other items such as rum and sugar are only good for selling and will fetch you some much-needed coin throughout the game. Another way to upgrade Kenway himself or get some extra money is through hunting and whaling. All major islands and areas feature some form of wildlife that may be hunted, skinned and used for upgrades. There are also specified areas in which you may hunt sea creatures such as humpback whales and great white sharks in order to sell the skins for money or to use them for personal upgrades. A new feature to the Assassin’s Creed series that is showcased in Black Flag is exploring sunken ships. After a certain point in the game you may sail to designated ship wrecks and swim about collecting treasures with the use of a diving bell. This feature is extremely fun yet very challenging as air supply and enemies such as sharks become an issue. It’s innovative to have such a feature though and if you choose to brave the depths of the sea then you will be handsomely rewarded. 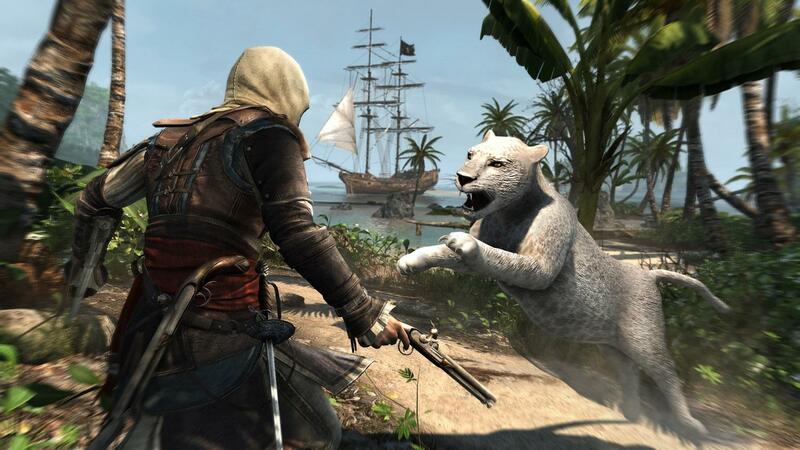 Graphically, Assassin’s Creed IV: Black Flag differs from platform to platform. The current generation consoles (PlayStation 4 and Xbox One) feature an upscaled 1080p experience which looks beautiful. Obviously the PC is comparable when the settings are set high but the PlayStation 3, Xbox 360, and Wii U versions are lesser in quality, though not by much. It’s mostly in the details as the game looks generally the same on all platforms. For example, faces look smoother and more realistic on the PlayStation 4, Xbox One, and PC but the animations are the same regardless of what platform you choose to play on. All around the game looks nice and the environments are gorgeous. One thing to note with the current generation consoles is that the water looks amazingly good. Since you end up spending a lot of time sailing the seas it’s a pleasant detail to notice. The voice acting is very well done, every character has a distinctly recognizable voice and way of speaking. This makes for a lot of diversity among the large cast as well as adds a bit of realism to the game. Likewise the dialog is extremely well done, the story comes alive through the dialog and character interactions and I feel it is one the best aspects of Black Flag. Another great attribute of the game is the soundtrack, shanties, and sound effects. From ambient music to the fanfare of naval battles, Black Flag hosts impressive auditory features. The sea shanties sung by your crew as you sail the seas are charming and catchy, before long you’ll find yourself singing along with your shipmates and having a jolly good time. I personally found Assassin’s Creed IV to be the most enjoyable game in the series thus far, I could hardly get myself to put the controller down. I never grew tired of the narrative or characters and being emotionally involved with both. Being able to explore so freely in such a well put together environment really made the game for me. I loved the seamless historical addition of characters such as Blackbeard, Anne Bonny, Calico Jack, and Mary Read. There was a lot of effort put into weaving these historical figures into the game and it was so well done that the development team deserves some serious recognition. I would recommend this game to anyone looking to have fun and explore the West Indies in a pirate adventure related to Assassin’s and Templars, even if you have yet to play any other game in the series. It’s easy to follow and even easier to fall in love with. Previous Previous post: Reader Discussion – Added Multiplayer: Yay or Nay? I agree with you that this is the best game in the series so far. So much fun! Thanks! I don’t really care much for the AC series to be honest so I was blown away by how much I feel in love with this game. I’ve played through 2, parts of 3, and a little of Revelations and was not impressed but 4 just knocked it out of the park and gave me everything I wanted out of the AC series! Did you experience any of the glitches on playstation 4 that I’ve been experiencing on the Xbox 360? It’s frequent enough to really distract me from an otherwise terrific game. No, I actually did not experience any glitches that I can recall. Nothing enough to distract me from the experience. It’s too bad you encountered such issues.